The underside of the starfish is covered with hundreds of tube feet, which it uses for walking around, for attaching tightly to rocks, and for holding on to prey. To move, each tube foot swings like a leg, lifting up and swinging forward, then planting itself on the ground and pushing back. 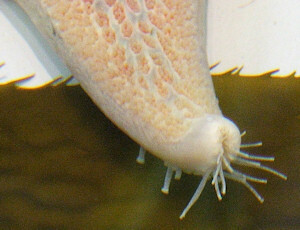 At the tip of each tube foot (in most species) is a suction cup. These aren't used when walking on level ground, but can be used when walking up sheer surfaces. With so many little legs, starfish can reach enormous speeds — I've clocked Asterias vulgaris going over 30 centimeters per minute! (That's 60 feet per hour.) And some species, like the inestimable sunflower star Pycnopodia helianthoides, go even faster (Pycnopodia gets up to four times as fast as Asterias). Dermasterias imbricata showing off its tube feet. This particular posture, with the tip of the ray curled back and the tube feet extended, probably has more to do with smelling than walking, and is very common. Side view of one ray of a walking starfish, with tube feet. A single tube foot in motion. The bulb at the top of the tube foot (it's actually inside the starfish, but it's easier to see this way) is called the ampulla. When the ampulla contracts, it's squeezing water down into the tube foot, which then extends. To retract the tube foot, the ampulla relaxes. So, extension and retraction of the tube feet are by water pressure. (But muscles are used to bend the tube feet.) The tube feet and the ampullae are part of the water vascular system of the starfish, which connects them all together. The ring in the center is the Ring Canal. It's in the central part of the starfish. A Radial Canal runs down the length of each ray, with a row of ampullae and tube feet on each side of it. Also coming off the Ring Canal is the madreporite. The madreporite is like a sieve or strainer, and filters out particles in the water. 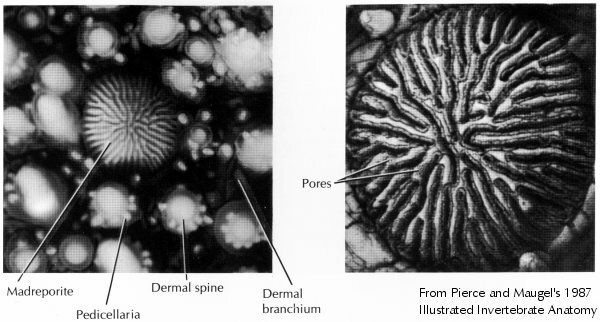 It allows the water to enter the water vascular system from outside the starfish.